“What to eat on a hot summer’s day? You could do a whole lot worse than a bowl of cold soup”. So believes River Kitchen’s Hugh Fearnley Whittingstall. 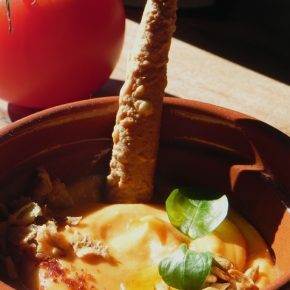 Chilled soups are enjoyed throughout Spain with perhaps Gazpacho being the best-known of all. A classic from the Andalusia region of Spain, made from tomatoes, peppers, cucumber, olive oil, sherry vinegar and garlic, it is full of ripe summery flavours. Other cold soups include the refreshing Ajo Blanco or White Gazpacho, made with almonds, that features in the Guardian’s 10 Best Spanish Recipes for the Summer. And then there’s Salmorejo, a soup originating from Córdoba in the south, gazpacho’s thicker, creamier cousin. 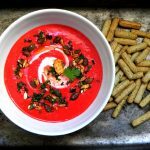 Basic Salmorejo is like a pared-down gazpacho, made with just garlic, vinegar, olive oil, tomatoes and bread. Whilst gazpacho is often drank straight from a glass, this dish is thick and creamy and often topped with hardboiled egg and crisped chunks of serrano ham. 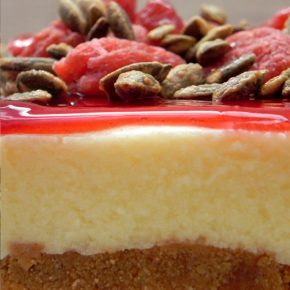 The creaminess is not from any added cream though, it’s the combination of the olive oil and the tomatoes that gives it its smoothness and richness. Strawberry Salmorejo is a variation on this classic Córdoban dish that uses strawberries together with the tomatoes. Like the tomatoes they also bring some acidity to the dish and so the balance of the taste in the soup is very similar. In fact, you’ll find that strawberries often deliver more acidity than tomatoes so you’ll need less vinegar to balance the dish out. A bowlful of this delicious cold soup makes the perfect quick, refreshing lunch. First you need to remove the skins from your tomatoes. In a large pot of boiling water, scald the tomatoes for about a minute. Remove and place immediately in a bath of cold water. The skins will then peel off easily. Next remove the pith as well as any hard parts from the tomatoes. Similarly, clean your strawberries and remove all the leaves and any hard bits. If your bread is not slightly stale, such as from the day before, you should toast it for a bit to crunch it up. Then, in a food processor add the tomatoes, strawberries, garlic and the bread and blend until everything has been well combined. Whilst processing, slowly add the olive oil, salt and vinegar and continue to process until smooth, or approximately 10 minutes. At this point it is worth trying the salmorejo, to check whether you need more of salt or vinegar. If the mixture is too thick, pour in a bit of cold water. Chop your basil leaves. 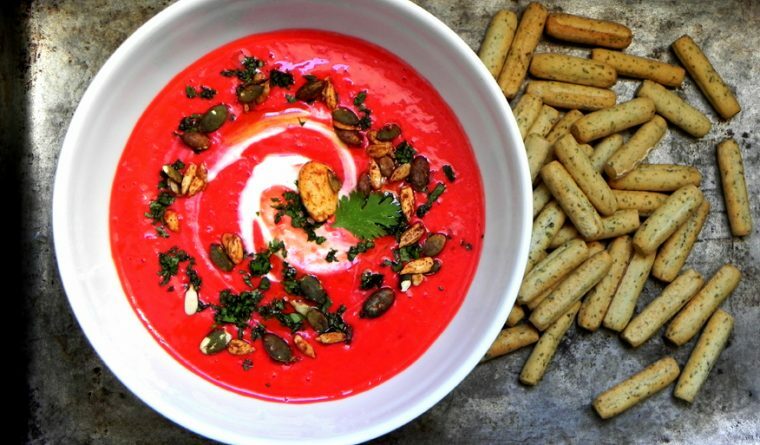 Then pour your salmorejo into a bowl and add the greek yogurt, basil and spicy nut mix to garnish. Serve cold from the fridge together with your seaweed flavoured breadsticks. 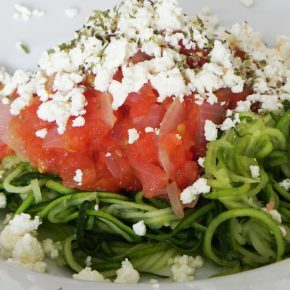 It will keep in the fridge for a few days and makes a refreshing, quick meal on hot days!